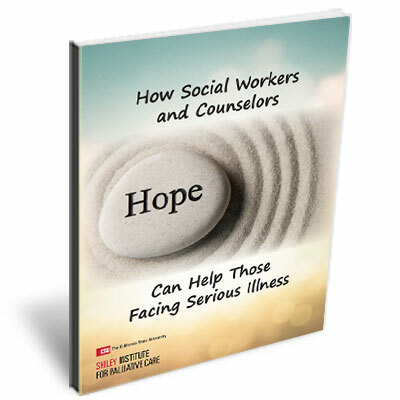 Every day social workers and counselors work with clients whose long-term suffering, whether from physical, mental, emotional, or spiritual distress, is deeply affecting their quality of life. Families and loved ones may be affected as well. Infuse your talent reserves with new or refreshed knowledge from the CSU Institute for Palliative Care’s fully online course, Critical Skills for Social Workers and Counselors. Conducted in a cohort, students enrolled in this course are led by a qualified instructor, and have the opportunity to meet and interact with peers and colleagues from all over the nation and in widely diverse practice settings. Get the Brochure/Join the Interest List! Get your special report to help you work with families and patients when facing difficult conversations. Exploration of types of care provision and the teams that deliver care. What kind of team do you work in? Critical thinking, self-examination, self-awareness. What level of ambiguity are you comfortable with? What are your firm beliefs? How do these help or hinder your work? Using problem solving skills not only with patients but within your work team and administrative leaders. Looking at role delineation, boundaries and flexibility, assertiveness, going outside our comfort zone. This is at the foundation of social work practice. How is the assessment process altered when chronic illness, depression, and lack of support systems underpins the client’s situation? Moving from emotional support to action plans and targeted clinical solutions. Understanding automatic thoughts, changing negative thoughts to positive thoughts. How do family dynamics come into play? How Social Workers and Counselors can impact symptoms. Looking at Scope of Practice and working within an interdisciplinary model. Understanding grief and loss starts at the onset of illness. Assessing needs and using techniques for resilience and meaning making in the face of loss. I am using the motivational interviewing decisional balance which is amazing! I am more comfortable with people with a terminal illness and feel like I have more knowledge and tools which is really gratifying!!! The instructor provided helpful feedback to each person submitting to the class’s discussion journal entries. She suggested interventions that could be implemented practically. I loved the course! It was so helpful to me and I plan to utilize all the resources and interventions in my practice. Is taught by: Currently practicing social workers in palliative care. Is ideal for: Experienced and new social workers and counselors working in hospitals, hospices, skilled nursing facilities, physician offices, home care settings, clinics, insurance groups and private practice. The 8-week online course has been designed by leading palliative care experts who are actively engaged in today’s palliative care issues. Discuss strategies in working with a multidisciplinary care team. Use cutting edge therapeutic techniques to help patients and families throughout the illness continuum. Navigate common ethical concerns in working with death and dying. This course is ideal for social workers that currently work or hope to work as part of a palliative care team in a health system, skilled nursing facility, physician practice, or other non-hospice care setting. Social workers wanting to learn how to integrate palliative care skills into their work caring for seriously or chronically ill patients. Social workers seeking to increase their ability to support patients and their families in their final years of life. Critical Palliative Care Skills teaches the essential skills that every social worker needs to know. If your career involves even occasional involvement with palliative care, then you’ll find this engaging and interactive course an ideal way to build your confidence and keep your knowledge and skills up to date.